Over the weekend I went out to the North Fork with my family. It was one of the first times we were all together in months and it was so much fun! It also opened my eyes to a part of New York that I'd never before seen. If you haven't been, the North Fork is really quaint - it's full of vineyards, farmland and rocky beaches and is a calmer version of the Hamptons South Fork area. It was the perfect place to relax for a long weekend. Highlights included oysters from the Peconic Bay at Little Creek Oyster Farm & Market, beer tasting at Greenport Brewing Company, rose tasting at Kontokosta Winery, and just wandering around the cute little town and seeing all the retro cars driving by. It was the perfect escape from the city on a hot weekend and I'd definitely recommend to anyone looking for a quick trip. Speaking of the end of summer, this recipe is perfect for celebrating the final days (or weeks if you are someone like me who maintains that the REAL end of summer is actually September 20th). There's nothing I love more than a good seafood pasta. Pasta with clams is always a hit in my family so I wanted to do a little twist on what we typically make and use cockles instead. They're smaller bi-valves but equally delicious and even more flavorful in my opinion. This dish paired with a cold glass of Sutter Home Sauvignon Blanc has been my go-to the past couple of weeks. In a large heavy bottom pot, bring salted water to a boil. While the water is being brought to a boil, in a sauce pan, combine olive oil, wine, basil, capers, spices, and tomatoes to a simmer until the tomatoes begin to burst, using medium high heat. Once water is boiling, add in fettuccine and cook according to package instructions. At the same time, add in the cockles to the sauce mixture and reduce heat to medium and cover. Drain the pasta and place into serving bowl. Once the cockles have opened (remove any that haven't opened) remove the sauce pan from heat. Pour cockle and white wine sauce over the pasta, top with pecorino romano and enjoy! I like mine with a cold glass of sauvignon blanc. This post was sponsored by Sutter Home Wines. Find out more about their amazing wine here. Is there a better pairing? It's been so humid and sticky in New York City lately that after a stressful (and sweaty) day, sometimes all I want is a chilled glass of wine. I'm pretty easy with wine. In the summer, I like my whites and roses fruity but dry. After all, the point is to feel refreshed in the heat! And, when a dry white/rose is paired with a sweet dessert there's truly nothing better. I mentioned this a couple weeks ago but this summer has been so crazy that I haven't had a chance to bake as much as I'd like. It's tough because summer means relaxation but also always being on the go, taking advantage of the summer Friday half day, and spending as much time at the beach as possible. I had one weekend in the city this month (can you believe that?!) and I spent it baking with the most summery ingredient I could think of - cherries. 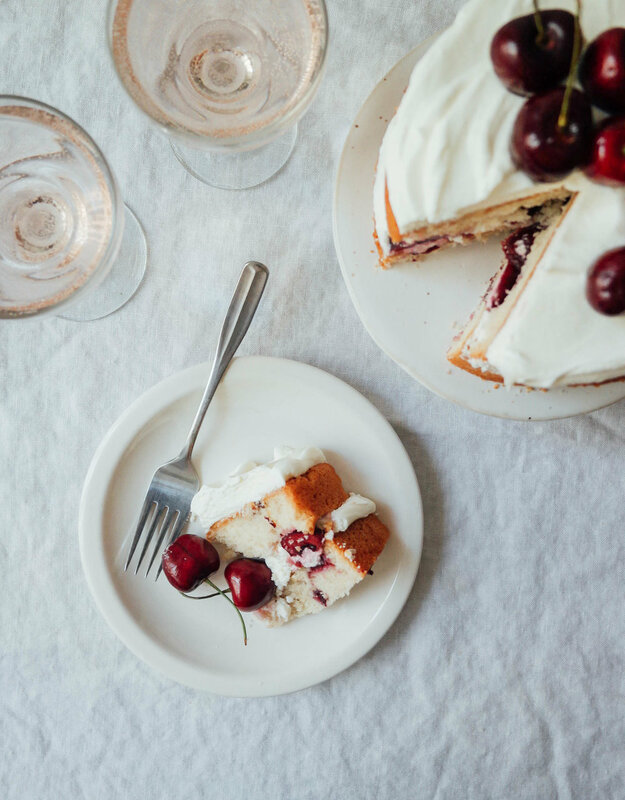 This Cherry Almond Layer cake is so flavorful but also really light. It's perfect for your end of summer gathering with friends, especially because the layers gives the impression that you spent hours decorating it, when in fact you just sliced a cake in half lengthwise. Hey, fake it till you make it, right? I paired my slice with a chilled glass of Sutter Home Rose. The flavors melded together perfectly since with wine was tangy, dry and refreshing, and the cake was light and sweet. I think this combo is going to become my go-to in the years to come. Preheat the oven to 350 degrees F. Oil a 6 inch round cake pan and set aside. In a medium bowl, mix together flour, baking soda and cornstarch and set aside. In a large bowl, whip together the sugar and butter until light and fluffy. Add in egg whites one at a time and continue mixing. Add in oil and vanilla extract and mix. In batches, add in the flour mixture and continue mixing slowly until everything is incorporated. Finally, add sliced fresh cherries and stir together. Transfer the mixture into the cake pan and bake for 30-40 minutes, until a knife that's inserted comes out clean. Let cool and once the cake is cool, carefully take it out of the pan by inverting it onto a tray and cut it in half so there are now two layers. Make whipped cream frosting by mixing all ingredients together in a Vitamix or similar blender. Build cake by placing one layer down on a cake stand, adding on a layer of whipped cream, a layer of sliced cherries, and repeat. Decorate top of cake with cherries if desired. Enjoy with Sutter Home Rose! I have to admit something. This recipe came about because of an accident. I was making a pastry dough for a fruit galette, wasn't paying attention and added WAY too much salt. Oops! That is what happens when you're listening to music when you make (most likely Drake if we're being honest right now) and get carried away with the salt and add a full teaspoon instead of 1/4 teaspoon. It was no longer usable for anything sweet so I annoyedly wrapped the dough in plastic wrap and stuffed it in the freezer for later use. Then when Rebecca from Square Meal Round Table emailed about a Summer Ingredient Collaboration with tomatoes, I immediately remembered the ball of savory dough in my freezer AND the time I went to my friend, Margaux's, apartment for dinner and she made an amazing tomato tart. I grabbed the dough out of the freezer, bought some fresh heirloom tomatoes (which are SO good this time of year) and made this super easy tomato tart. I guess this goes to show that just because you mess something up when you're baking doesn't mean it is totally worthless. Pre-heat the oven to 350 degrees F and roll out the tart dough using flour and a rolling pin (or you can roll it out between two sheets of parchment paper. Try to make it into a circular shape, although it doesn't need to be perfect. Once it's about 1/8 inch think, drizzle some olive oil on it, and layer the tomato slices in the center. Gently fold up the edges of the dough so they overlap the tomatoes. Top with salt, black pepper and basil. Bake for 35-40 minutes, until the crust is golden brown. During the summer and growing up in the suburbs, some of my best memories revolve around chasing the ice cream truck down the street (after begging my parents for a couple dollars) and sitting around a pool eating those frozen popsicles that came in a skinny plastic tube that you pushed out as you ate. I can't remember the name of them but I do remember eating tons of them, and always going after the yellow, red, or pink flavors purely because of the colors. My neighborhood friends and I would sit around outside eating them by the box, which I'm sure thrilled our parents, and I remember watching in wonder as the color faded from the ice as we sucked out the juice. Today, I still love frozen things, whether it's a smoothie, ice cream, frozen margarita, milkshake - you name it, and with the current heat wave going on in New York, I was craving a frozen beverage. There's nothing better than fresh honeydew, and the addition of the lemon juice and lemon verbena syrup matched perfect and made these slushies super refreshing. The melon also gave them a super smooth consistency. Although we didn't enjoy these with any alcohol, I can envision them being especially tasty with the addition of a shot of vodka or gin. If you try it out that way let me know! In a medium sauce pan, make lemon verbena simple syrup by mixing together a handful of fresh lemon verbena leaves, 3 tablespoons of granulated sugar, and 1/4 cup water. Simmer until thickens and strain the syrup into a bowl and set aside to cool. On Sunday night, Pat and I returned home from almost a week in Cape Cod and it's safe to say that our apartment is kind of a mess. We've both been so busy with work this week that we haven't had time to clean and it's starting to stress me out a little but I am trying to remain calm and am planning to focus on organizing everything this weekend (to be fair, he is the one who still has yet to unpack his suitcase...) ugh. I've said this before, but when I was in high school I worked at Ben & Jerry's and one of my favorite parts of the job was making milkshakes. I RARELY ever make them at home (I kind of forget about them unless I'm at Shake Shack, plus they are super unhealthy) but sometimes they really hit the spot. I had some frozen cherries in my fridge from a fresh bunch I bought a couple weeks ago at the farmers market, and a pint lying around so I decided to throw them together. This one is easy - blend everything together (I use a Vitamix), adding more liquid if necessary, and pour into two cups. Top with whipped cream.